There’s nothing better than spending a day soaking up the sun during the summer, whether you enjoy biking, jogging, swimming, or lounging by the pool. But when it’s time to cool down, there’s no bigger disappointment than heading inside to find your home is hot and muggy due to your air conditioner overheating. Keep your AC running in top condition all summer with just a few easy steps. Your air conditioner has an indoor and an outdoor unit that relies on clean condenser coils to lower air temperature. The inside unit uses refrigerant to absorb the air and cool it down, while the hot liquid refrigerant flows to the outside unit that releases the heat. If your condenser coils are dirty, the refrigerant cannot release the heat. This will result in your air conditioner running longer, causing it to overheat. Scheduling regular maintenance from an HVAC expert will ensure that your condenser coils are being cleaned using the proper solution and in accordance with the manufacturer’s recommendations. In between visits from professionals, be sure to remove twigs, dirt, and other debris from around your condenser coils to prevent clogging. Low refrigerant levels cause a similar problem as dirty condenser coils — your air conditioning unit will run longer causing it to overheat. Unfortunately, adding more refrigerant won’t solve the issue in these cases. An expert needs to confirm the leak and drain the current refrigerant in order to make the proper repairs and replace the refrigerant. The air filter is one of the most important parts of your unit. It protects from pollutants, dust and dirt. When it gets dirty, it blocks air flow to the entire system, forcing the AC unit to work harder and eventually overheat. Worst possible scenario: If your air filter gets dirty enough the whole system may break down. Luckily, replacing an air filter is something that can easily be done at home. Be sure to change your filter according to the guidelines from the manufacturer, and change it roughly every one to three months depending on use. If you need information on what type of filter to purchase, don’t hesitate to contact the HVAC experts. If you are dealing with consistent air conditioning overheating or you are concerned there may be a refrigerant leak, contact our team at Sedgwick Heating. We can help assess the problem, make the proper repairs and help prevent further issues. 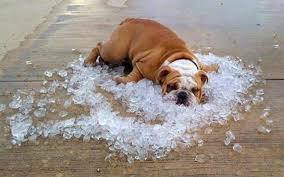 We can keep your home cool and comfortable all summer long!